Whispers in the Loggia: Dispelling the "Black Legend"
In a rather amusing conversation just the other day, the topic of Pope Pius XII came up. A friend mentioned one of the many stories of Eugenio Pacelli's controversial confidant, Mother Pasqualina Lehnert, often referred to even now by her nickname: "La Papessa." Pius' undisputed gatekeeper, de facto private secretary -- and, so it's said, mother-figure -- Lehnert, who had been at the career diplomat's side since his stint as nuncio in Berlin, exercised influence of a then-unprecedented kind in the papal apartment -- and, by extension, over the Roman Curia. Such was the prelatial fury over said clout that, within minutes of the committal of her protector's body to its tomb (the instant when, in the bygone etiquette of the pontifical court, its members lost their honors and privileges until the Apostolic See was refilled), the Cardinal-Dean Eugene Tisserant ordered la Madre to depart the Vatican by nightfall. Heading out by cab, a photo was said to be taken of Pasqualina riding away, but not without company; by her side was Pius' goldfinch, Gretel, perched in its cage. The last Secretary of State to rise to Peter's chair, Papa Pacelli's 19-year reign (1939-58) is one of a deep, complex, colorful and multi-faceted historical record, touching elements as diverse as geopolitics, liturgy, Mariology and interfaith relations... to name but a few. For all that, however, many of the generation who grew up in his pontificate (and even some who didn't) hold fond memories of the Pope with the kingly bearing, the last Romano di Roma to occupy his hometown's episcopal seat. As the story above illustrates, the affection and mystique surrounding Pius continue on in many quarters almost a half-century since his death -- just as the amount of controversy he's inspired among historians, authors and other critical observers has markedly increased. If a speech given earlier today by Pacelli's successor overlooking San Damaso is any indicator, however, Benedict XVI appears set to go to bat for his predecessor's beatification. Speaking at the presentation of a new book on Pius by Andrea Tornielli -- vaticanista of the Italian daily Il Giornale -- Cardinal Tarcisio Bertone SDB robustly defended the late pontiff's legacy in a 3,000 word address, highlighted by a stringent rebuttal of the charges that Pacelli's lack of candor played a role in enabling the Shoah, or Holocaust. Bertone argued that while Pius XII made his anti-Nazi sentiments clear, he avoided dramatic public confrontations in order to spare both Jews and Catholics more dire persecution, and to protect the Church’s ability to work behind the scenes. In early May, the Vatican’s Congregation for the Cause of Saints voted to approve a “decree of heroic virtue” for Pius XII. If signed by Pope Benedict XVI, the move would leave only the need to document a miracle in his path to beatification. As one illustration of what Bertone called Pius XII’s “quiet” action on behalf of Jews, he revealed that in October 1943, the Vatican asked the Nazi authorities who had occupied Rome for permission to add more than 4,000 people to its Palatine Guard, which then numbered 575. The hope, Bertone suggested, was to thereby protect Jews in the nearby ghetto. Bertone’s arguments did not satisfy Abraham Foxman of the Anti-Defamation League, one of the leading critics of efforts to beatify the wartime pope. “I wish they’d spend a higher percentage of their time in efforts to open the archives, and less in spinning what they’re selectively presenting,” Foxman told NCR, referring to debates over the fact that the complete Vatican archives from the years of Pius XII’s papacy have not yet been opened to researchers. The Vatican has, however, published a 11-volume set of material from those years which it says contains everything relevant to the pope’s attitude toward the Nazis and the broader issues raised by the war. It seems useful to me to underline how the work of Tornielli brings to light facts already known to serious historians. One of the merits I regard as fundamental of the volume we’re discussing today, taking account of the very sad times in which Pope Pacelli lived, is that it shows how the Pope’s voice, in the turbine of the Second World War and the opposition which followed between two blocs, did not enjoy the favor of those in power. How many times was the elecriticty “missing” for Vatican Radio to make the words of the Pontiff heard; how many times was the paper “missing” to reproduce his thoughts and teachings, which made some uncomfortable; how many times did copies of L’Osservatore Romano end up “missing,” which reported his speeches, clarifications, updates, and political notes? Today, however, thanks to modern resources, these sources have been fully reproduced and are available. Tornielli has sought them out and found them, as witnessed by the large body of notes which go along with the book. In this regard, I’d like to draw attention to an important point. The figure and work of Pius XII, for which people gave praise and thanks during and after the Second World War, began to be scrutinized with a different eye in a very precise historical period, from August of 1946 to October of 1948. The desire of the martyred people of Israel to have their own land was understandable, their own secure refuge following “the persecutions of a fanatic anti-Semitism directed against the Jewish people” (allocution of August 3, 1946). But it was equally understandable that those who were already living in Palestine expected to see their rights respected, and to receive attention, justice and protection. The newspapers of the period refer amply to the state of tension which existed in the region, but because they did not want to consider the reasoning and proposals of Pope Pius XII, they began to take sides, some one one side and some on the other, thereby ideologizing a reflection that developed in a very articulated fashion, attentive to criteria of justice, equity, respect and legality. 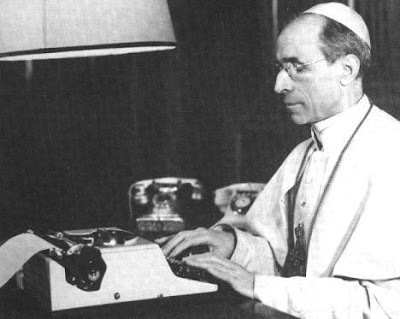 Pius XII was not only the Pope of the Second World War, but a pastor who, from March 2, 1939, to October 9, 1958, had before himself a world seduced by violent and irrational passions. From that point forward, an incomprehensible accusation began to take shape that this Pope had not intervened as he should have in favor of the persecuted Jews. In this regard, it seems important to me to recognize that anyone who is free of ideological interests and who loves the truth can understand more deeply, in full sincerity, a long, fruitful, and, in my view, heroic papacy. One example is the recent change in attitude in the great sanctuary of memory which is Yad Vashem in Jerusalem, to reconsider the figure and the work of Pope Pacelli not from a polemical point of view, but from an objective historical perspective. It’s my fervent hope that such good will, manifested publicly, can lead to an adequate outcome.